Hikers and mountain bikers who go on vacation on Lake Garda and in Lessinia know how enjoyable and interesting it is to hike and mountain bike inthese scenic areas near Verona. These considerations, and with the intent of making trips to one of the most beautiful areas on Lake Garda and to the Lessini Mountains convenient and accessible toa growing number of cyclists and hikers, led to the idea of using thebus as a means for climbing up and reaching strategic points fromwhich you can depart for wonderful walks and mountain bike rides, inbreathtaking landscapes and through ancient hamlets, enjoying typicallocal specialties. Fans of Lake Garda can use the services of Line 470, which starts from Garda, to reach the towns of San Zeno di Montagna and Prada. Departures from Garda to S. Zeno-Prada at 8.03 a.m., 11.36 a.m., 3.06 p.m., 5.56 p.m.
Departuresfrom Garda to S. Zeno at 10.08 a.m., 2.08 p.m., 7.32 p.m. One-way ticket + bike charge of 2 €. Bikes are included with the ATV daypass! This service is offered starting from June 16, 2018 every Saturday and Sunday with departure from the Verona Porta Nuova Bus Station at 9:00 a.m. and arrival at Bosco Chiesanuova at 10:20 and at San Giorgio at 10:30. The return bus leaves at 6:00 p.m. from San Giorgio and arrives at Verona Porta Nuova at 7:30 p.m.
>Thanks to Fuorisellamtb.it, a group of three sporting associations(Teste di Marmo, Raccoon Riders and Km Sport) two GPS routes arepublished departing from the Bus Walk&Bike stop at San Giorgio. 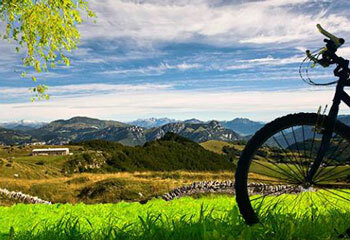 These are enduro routes which require a certain amount of preparationbut which guarantee adrenaline and fun. The trails are beautifuleven on foot.